To give you a good starting place, the articles below all contain some good nuggets relating to productivity and reducing the overwhelm. One of the reasons why so many of us to feel so overwhelmed comes from the simple fact that we are really trying to take on and do too much. We all share the same number of hours in the day, and there is only so much that we can do during that time. There are of course ways we can organize what we are trying to do so that it can be done more optimally, in sync with our bio-rhythms, etc. Beyond that though — and really this is a better place to start than most productivity techniques — trimming down the amount that we take on works wonders. Olivia Derby takes on this topic over at the Trello blog, and offers some insights worth your consideration. 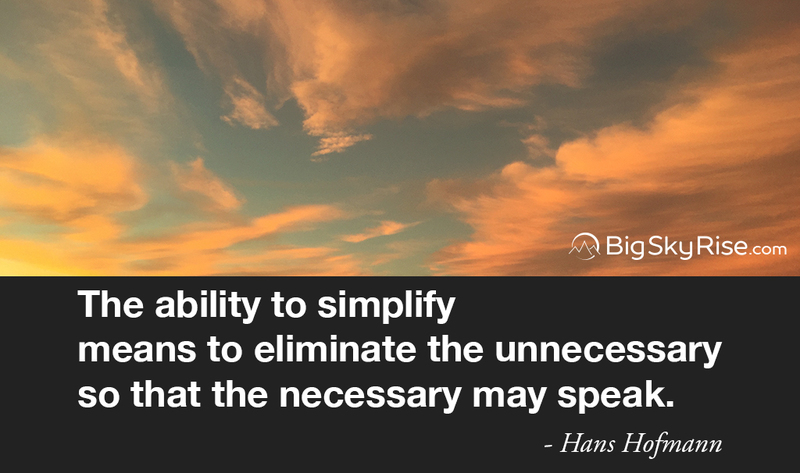 Related to the idea of doing less to increase productivity is the idea of simplifying life overall. By trimming down across many of life’s areas we can increase our productivity as well as our overall satisfaction. The article Things you need to simplify to enjoy your life more by Rachel Bartee provides a great overview of this. For many of us, while it can seem counter-intuitive and a bit hard to accept, the truth is, often times, we can be more productive by relaxing more. As an introduction to this idea, see how when you relax your brain you’ll learn more and be happier — plus, you’ll be able to get more done since you’re more present in the task at hand. There have been a number of posts on BigSkyRise touching on the importance of the gut in our lives. When it comes to productivity, our gut also plays a part. Just like how eating poorly can lead us to become fatter, slower, and unhappy, it can also lead our productivity levels to slow to a crawl. Conversely, eating well can give us a much needed boost. Read on to discover the science behind how your nutrition will decide your productivity for today. Taking it step-by-step though, there are many ways to combat it. Please consider sharing this post so that others can benefit from a wide array of resources to help reduce the overwhelm and live a happier, more fulfilling life.